Catholic children of West Drayton were original educated in a cottage in Money Lane until in 1868, Fr Michael Wren built a small schoolroom behind the newly built church and St Catherine School was established. Originally children from 3 – 13 years old were all taught in the same room, until 1886 when the schoolroom was split into and infant and juniors. Fr Wren was a regular visitor in the school and was constantly looking out for the welfare of the children, such as arranging outings to places like Burnham Beeches for them. The school building underwent alterations and upgrades in 1925 as it had been deemed ‘unsuitable for purpose’ by H.M. Inspectors. Whilst the renovations took place, children were educated in the church. The school continued to expand and by 1931 there were 70 children on roll. However, expansion meant that the school building was becoming increasingly crowded, and so on 25th March 1939 the new school building was officially opened by Bishop Aeliae. On April 3rd the building was used for the first time and now pupils were split into three classes. However the outbreak of war meant that life in the new building was far from plain sailing. Reduced teaching sessions were imposed and cloakrooms converted into air-raid shelters. Overcrowding became an issue again in the 1950’s and so in 1953 the infant children were moved back into the old schoolhouse building. By 1955 there were a total of 250 children on roll. Then in 1959, 20 years after the original plans had been made, the school was expanded again, with 4 new classrooms being built and the outdoor veranda enclosed into the downstairs corridor we have today. 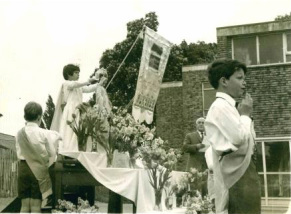 In 1963, the school found itself in the unusual position of no longer being overcrowded when the senior children all transferred across to the newly opened Douay Martyrs school. The last major changes were made in 1986 when the school nursery was opened and further improvements were made to the building. And who knows what changes the school will see in the future.